Well, I'm still a bit brain dead from our weekend road trip - though, okay, actually at this point I'm just a bit brain dead from all the catch up I've been doing. Yesterday was laundry day. Today I need to get the rest of the house up to code. But fortunately, one chore included in that is getting the pool chemicals straight. That's right! Our pool is finally back! We ended up with a leak in it a bit ago and ordered a new pool body but it arrived the day before we left on our trip so we didn't get to put it up. Naturally, we didn't want to put it up right after we got back either. So evening before last we (and I really mean Dan) set it up and got it filled with water. And last night we (and again, I really mean Dan) got the pump hooked up to it. So that means I can get the chemicals all straight and actually get in it today! Yay! This is good because I feel like I'm turning pasty white again and that's not a happy thought in the middle of summer. But back to the brain deadness. I can't always knit when my brain is mush, but my alpaca hat doesn't require the ability to count to more than 16 (and in most cases, I just need to count to three or four a few times in a particular order) so I've managed to get a lot of work done on it in the past two days. I realize this is a bit mad, but I'm kind of contemplating doing a second hat. It's just been such a good knit project (once I got it on my new needles) and I'd like to try to change up the colors a bit (though probably use the same ones just because I have a lot of the yarn left) but I'm not sure what I would need with two alpaca hats. But I think my subconscious wants to give it a try because I actually dreamed about it last night. 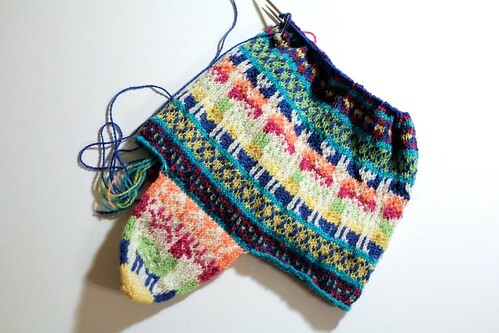 Of course, I can always use the charts from the pattern and see about making some matching mittens or something. That'd be ridiculously fun. It would require a bunch of upfront thinking which might eliminate the desire to do it, but I've done knitting-related math before (on this hat (though it ended up unnecessary once I changed needles) and on Dan's gloves) so I really should stop letting it intimidate me. Anyway, I'm on the crown of the hat which means it's the last section before finishing so I'm oh-so-close to done. But it also means that my current circular is going to be too big in the not too distant future for me to finish this project. Yes, I could magic loop but I really want to finish it on double pointed needles. That means, though, that the DPNs I ordered need to get here quickly! Of course, I imagine pool time will slow my knitting down a bit. I don't think those two activities should be combined. At least, not outside of a blog post.